In 1649 Jan Steen married a daughter of the painter Jan van Goyen. During this period Steen began to work as an independent painter as we know from two documented events relating to his works. The first dates from the early 1650s when Johan van Rhenen acquired a painting by Steen on the same subject as this panel for the Danish market. 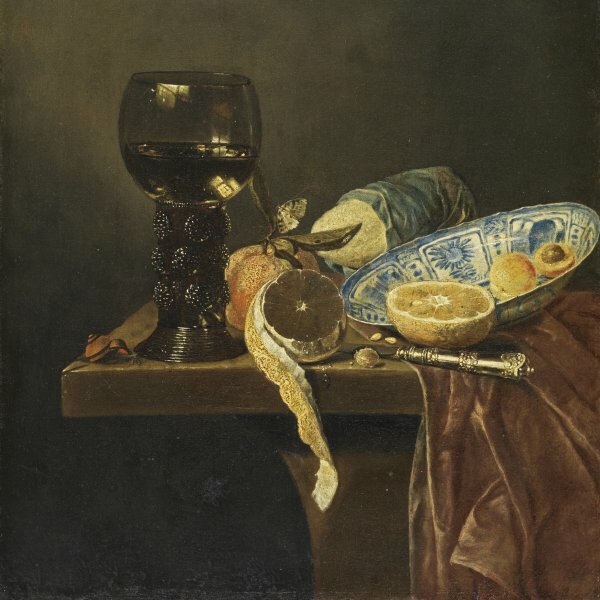 The second, dating from July 1651, relates to the acquisition of four works by Steen at auction by Harald Appelboom, agent of the Swedish governor of Pomerania, on behalf of the governor, Karl Gustav Wrangel. Appelboom paid 32 guilders for the four paintings, which was a relatively high amount for the work of a young artist just embarking on his career. 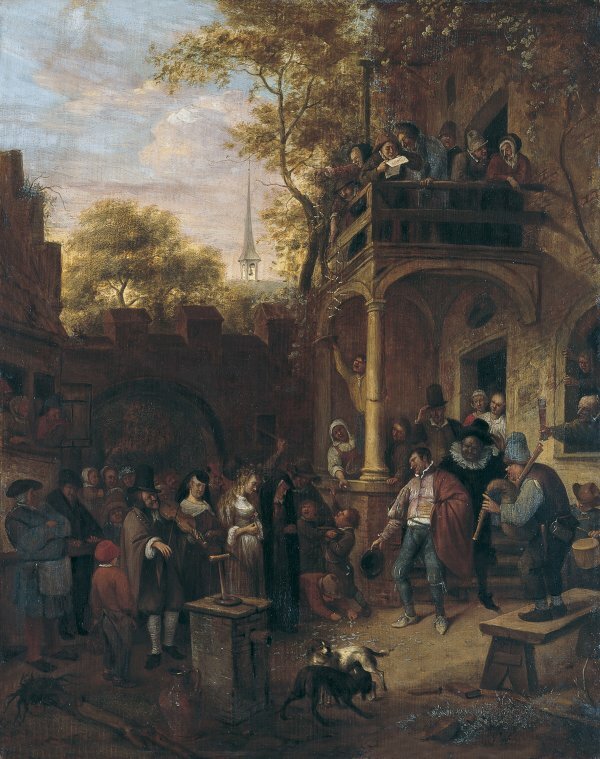 Steen painted scenes of weddings during his years in The Hague, depicting different moments of the ceremony such as the signing of the contract, the couple making their vows, the arrival of the bride and the wedding banquet. Ebbinge-Wubben considered the present panel to be a transitional work executed between the artist’s youthful and mature phases when he began to abandon exteriors and landscapes in favour of an exploration of human behaviour. The artist depicts the arrival of the bride in an exterior setting, at the doorway of an inn or the groom’s house. Dressed in white and followed by a rather motley retinue, she wears her hair loose as a symbol of chastity. The bride is accompanied on either side by two elderly women who wear the traditional huik, a cape with a projecting hood, which is in the more modern style in the case of the woman on our left. The groom, standing at the foot of the stairs that lead into the house, receives his wife with a rather exaggerated gesture of reverence in a slightly indecorous pose. All the elements of the scene suggest noise: in addition to the music produced by the rustic violinist, bagpipe player and drummer on the right, the viewer senses the clamour from the heated fight between two small boys which the father attempts to quell with his stick, the toast of the figures at the window and the attempt of another figure to read the epithalamium from the balcony over the porch. Each of these details suggests a rather exaggerated presentation of habitual customs, which together make up this crowded nuptial scene. Steen conveys his figures (which at times border on the caricatural) with a sense of mordant wit. To judge from the large number that has survived, paintings of this type must have been well received on the market. They have been interpreted as satirical visions of Spanish customs prevailing in the Southern Netherlands.